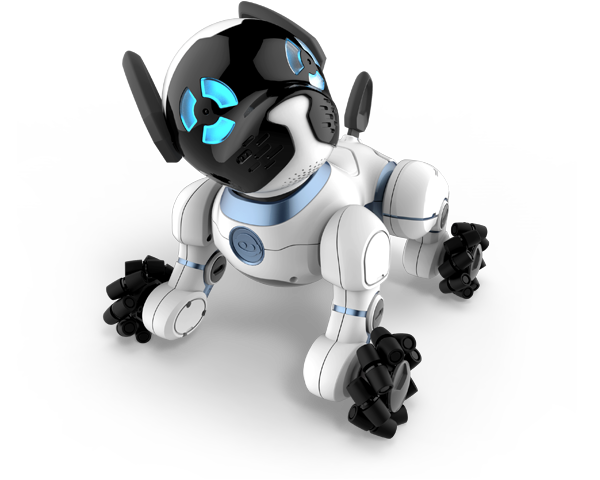 WowWee, a smart toy company, has unveiled a robotic dog with blue-green LED eyes. The dog, aptly called CHiP (short for Canine Home Intelligent Pet), sits with the tap of a button, picks up your presence in the room via bluetooth and plays fetch. The sensor-loaded pup comes with a toy-watch looking wristband that allows it to pick up your whereabouts. When you're happy with your "pet's" response, you can press down a thumbs up on the wristband as a sign of approval -- it's the digital equivalent of a belly rub. Your new loyal robot companion is looking forward to playing with you! CHiP will fetch the included SmartBall, follow the owner who wearing the included SmartBand, and will look for the included SmartBed when it is time to recharge after hours of play. Pat CHiP on the head for a variety of responses, feed CHiP using the app, or see how this smart dog reacts when you ask CHiP to do "Yoga" or other commands. CHiP is loaded with high tech sensors, plus fun sounds and animations that will entertain your whole family.